Danny Wolford was raised in New Point, Indiana. He attended North Decatur High School. Following high school, he attended St. Louis Christian College, where he earned a Bachelor's Degree in Christian Education. After graduating from SLCC, Danny served as a Pastor at Cisne Christian Church in Cisne, Illinois, from 1984 to 1988. From 1988 to 2001, Danny worked as the Athletic Director and Men's Basketball Coach at SLCC. Eventually, he felt called to move back home to further the ministries in Greensburg. 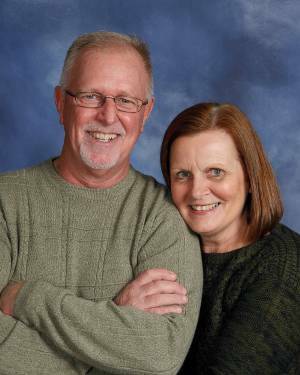 In 2001, Danny was hired as the Senior Pastor at FCC Greensburg. Danny currently lives in Greensburg with his wife, Barbara. They have 4 children. Their oldest daughter, Anisha, her husband, John, and their children, Ella, Josie & Liza live in Greencastle, Indiana. Their son, Joshua, his wife, Jaime, and their children, Myles, Blake, and Skye live in Carlyle, Illinois. Their daughter, Carrie, her husband, Bryce, and their children, Ruby, Neve, and Bostic live in Ballwin, Missouri. Their youngest daughter, Heidi is currently a student at Missouri Baptist University in St. Louis. In his spare time, Danny enjoys golf, biking, running, spending time with his family, and cheering on the St. Louis Cardinals!